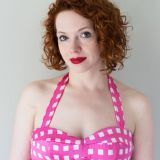 ​On the Front, staystitch along the shoulder and the neck edge to reinforce the corner. It is vital that you stitch exactly on the seamline right to the dot, pivot, and continue directly on the seamline. I found it helpful to use a Chalkoner to trace along the seamline to use as a stitching guide. Now, on the Back pieces, staystitch along the neck edge. ​Place both Back pieces right sides together, matching the notches. Sew the back seam. Finish the seam together and press to one side. I used a 3-thread serge to finish my seam. Place the Front pieces together at the collar with right sides together, matching notches. Pin and stitch the center back seam of the collar. Finish the seam together and press it to one side. Press it in the same direction that you pressed the center back seam. Very carefully, clip to each dot - but no further! ​Lay the Back right side up. Place the front right side down, matching the center back seams, dots and notches. Pin along the shoulder seams and along the back neck. Stitch from the edge of one shoulder seam directly to the dot at the neck edge. Pivot the garment and stitch along the neck edge until you reach the next dot. Again, pivot to finish stitching the shoulder seam. ​Now is the time to interface the Back Facing if you choose to. I did not, so instead I went ahead and staystitched ⅝″ along the outer edge. Press the seam allowance to the wrong side all along the staystitching line. Trim the seam allowance. ​Place the right side of the Back Facing to the wrong side of the Front/Collar, matching the center back, shoulder seams, notches and dots. Pin and stitch the Back Facing to the Front/Collar at the neck seam and partial shoulder seams. Sew this on the garment side so you can sew over your previous stitching. Remember to pivot the stitching precisely at the corner points. Finish the shoulder seams together. Trim and grade the neck seams to reduce bulk. Trim out a V shape at the dots. Then, press the shoulder seams and the back neck seam towards the back. Smooth and pin the Back Facing to the Back, wrong sides together. Topstitch along the outer edge of the Back Facing. Edgestitch along the shoulder and neck seams. 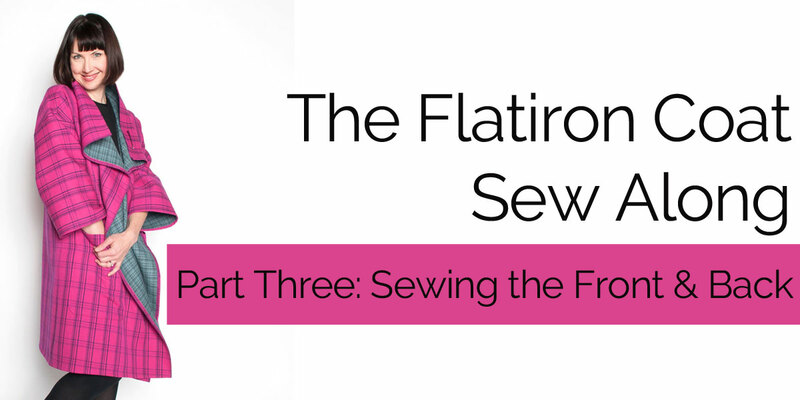 Join us for the next post in the Flatiron Sew Along, where we will be attaching the Sleeves and Side Seams and finishing the coat! If you are just joining us, be sure to refer back to the previous posts in the Sew Along.